Will President Obama’s recent trip to Cuba help Afro-Cubans? Devyn Spence Benson, assistant professor in the department of history at Louisiana State University, examines the challenges faced by this ethnic group and whether change is on the horizon on the Caribbean island. Devyn Spence Benson is an assistant professor of history and African & African American Studies at Louisiana State University. 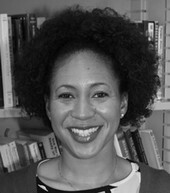 Benson received her Ph.D. from the University of North Carolina-Chapel Hill in the field of Latin American History, where her research focused on racial politics during the first three years of the Cuban revolution. She has taught at UNC-Chapel Hill, Williams College and now LSU. She is the author of published articles and reviews in the Hispanic American Historical Review, Journal of Transnational American Studies, Journal of Cuban Studies and PALARA: Publication of the Afro-Latin / American Research Association. Benson’s work has been supported by the Doris G. Quinn, Foreign Language and Area Studies (FLAS), and Gaius Charles Bolin dissertation fellowships. She has also held residencies at the Schomburg Center for Research in Black Culture in Harlem and the WEB DuBois Institute for African and African American Research at the Hutchins Center at Harvard University. 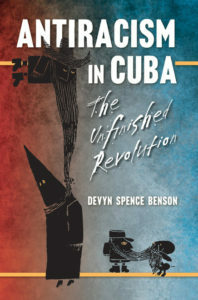 Benson’s newest book, Antiracism in Cuba: The Unfinished Revolution (UNC press, 2016) is based on over 18 months of field research in Cuba where she has traveled annually since 2003. You can follow her on Twitter @bensondevyn. On March 22, 2016, President Barack Obama became the first U.S. President to travel to Cuba since 1928. His visit represented a historic thawing in diplomatic relations between the two countries. But what did the POTUS and First Lady touching down in the Caribbean’s largest island mean for Cubans of African descent? Back when Presidents Obama and Raúl Castro first announced the normalization of relations in 2014, I emailed friends on the island to see how they were taking the news. An Afro-Cuban intellectual cautiously told me, “we will see what happens.” She expressed cautious optimism that economic openings in Cuba would improve the everyday lives of Cubans of color. This was an important point, especially since visitors to Cuba don’t always see the ways Afro-Cubans continue to be left behind with new economic reforms. During their short vacations, many tourists don’t notice how Afro-Cubans are discretely barred entrance into tourist hotels, or have limited access to good-paying, front-of-the-house jobs in major hotel chains. The outpouring of support for Obama’s words by all Cubans, especially Cubans of African descent, who were empowered by the image of confident black leader and his family, led some Cubans to attack Obama’s sincerity. When an official newspaper printed an article insulting Obama, written ironically by a black Cuban, other Afro-Cuban activists responded to these attacks quickly calling them racist and demanding that the government react. As we wait to see what the fall-out will be of Obama’s trip to Cuba, it appears that for Afro-Cubans the struggle for dignity and against racism continues.